Being environmentally friendly means having a lifestyle that is better for the environment. It’s about taking small steps to make this planet a better place for our communities and generations to come. Conserving water, consuming less energy, buying recycled products, eating locally grown vegetables, creating less waste, planting more trees are all great ways to start. What makes a product friendly to the environment? The materials it contains: Eco-friendly products usually contain material that’s been recycled, material that’s easily recycled, or material gathered from a natural source, like bamboo, which is easy to replace and minimally damaging to harvest. The way it’s produced: An environmentally friendly product can be made in a facility powered by solar power, for example, or in a building designed to use the least amount of water possible. 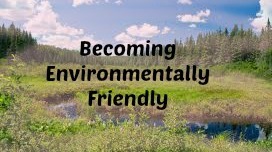 Why it’s Important to Become Environmentally Friendly? One reason is so that we can save our planet. Just think about the piles of plastic bottles that are thrown away that cannot break down into the land. Saving animals from extinction is another reason. There are so many of the various breeds of animals and insects that are becoming threatened because of our habits. Greener, environmentally friendly products are kinder to our health. I believe even small steps will help the environment - turning off lights when you leave the room or separating your garbage for recycling, conserve water and electricity, Drive Less, Walk More, Prevent Littering, Buy Recycled Products. Beauty wise, buying products with natural or organic ingredients can help as well. With all of the products we use on a daily basis, we absorb the nearly 130 chemicals into our skin. Making a few easy changes to our beauty routine can help. It’s a simple as choosing Recyclable Packaging. Use ingredients you already have - you can whip up a simple, effective face mask using honey and coconut oil, or create an acne-fighting toner with green tea. Next time you are buying makeup, choose one with Organic ingredients; it’s healthier for the planet and for our bodies.